At least 35 suspected Islamists have been killed in a sweep against the Boko Haram group in north-eastern Nigeria, the army has said. The army said it detained more than 60 others during operations in Adamawa and Yobe states. 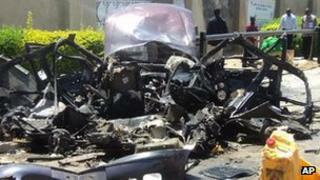 The Islamist group opposes Western influence in Nigeria and has carried out a string of attacks. On Sunday, an attack on a Catholic church in the north blamed on Boko Haram left two people dead. A military spokesman told AFP news agency that the operation took place overnight between Sunday and Monday and a curfew had been imposed in Damaturu, capital of Yobe state, ahead of the crackdown. Soldiers went door-to-door in three of the town's neighbourhoods and exchanged fire with militants throughout the night. Two soldiers were injured in the fighting. Dozens of guns and explosive devices, and hundreds of rounds of ammunition as well as 32 arrows and two swords were among items found in Boko Haram hideouts. The town has been one of the worse affected by the activities of the group, which wants to impose Sharia law across Nigeria. In June, gun battles between suspected members and the security forces paralysed the city, leaving some unable to leave their homes or places of work. Attacks in central and northern Nigeria blamed on Boko Haram have killed some 1,400 people since 2010.